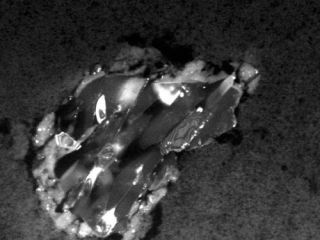 his image shows a comet particle collected by the Stardust spacecraft. The particle is made up of the silicate mineral forsterite, which can found on Earth in gemstones called peridot. Today marks the 10th anniversary of the launch of NASA's Stardust spacecraft, which is now more than 8.4 million miles (13.5 million kilometers) from Earth. Launched on Feb. 7, 1999, Stardust covered 3-billion-miles during its first seven years in space before returning the world's first samples from a known comet. Stardust's tennis racket-like, aerogel-lined collector was extended to capture particles hurtling at it at about six times the speed of a rifle bullet, as the spacecraft flew within 240 kilometers (149 miles) of comet Wild 2 in January 2004. The return capsule landed Jan. 15, 2006, in Utah, carrying interstellar and comet particles, completing the first U.S. space mission to return extraterrestrial material from beyond the orbit of Mars. The capsule is on display at the National Air and Space Museum's Milestones of Flight Gallery in Washington, D.C.
With its prime mission complete, NASA re-designated the Stardust mission as Stardust-NExT. Short for Stardust-New Exploration of Tempel, Stardust-NExT is a low-cost, Discovery Program mission of opportunity that will expand the investigation of comet Tempel 1 initiated by NASA's Deep Impact spacecraft. The extended mission tasks the Stardust spacecraft to fly by the comet Tempel 1 on Feb. 14, 2011. During the flyby, it will obtain high-resolution images of the comet's coma and nucleus, as well as measurements of the composition, size distribution, and flux of dust emitted into the coma. Mission planners hope Stardust-NExT will provide important new information on how Jupiter-family comets evolve and how they formed 4.6 billion years ago.